Following J.J. Abrams’ iconic use of IMAX® cameras in Star Wars: The Force Awakens, IMAX and Lucasfilm have announced that director Rian Johnson has captured key sequences of Star Wars: The Last Jedi using IMAX’s extremely high-resolution cameras, delivering IMAX audiences greater scope and increased image quality in IMAX’s exclusive aspect ratio for a uniquely immersive experience. 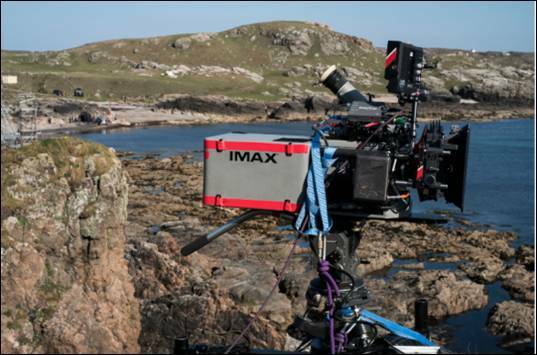 The news of Johnson leveraging IMAX cameras for key sequences of Star Wars: The Last Jedi comes as part of an extended slate deal announcement between IMAX and The Walt Disney Studios, a division of The Walt Disney Company. Building on their existing long-standing relationship, the two companies announced today that they have extended their multi-faceted agreement with a new multi-picture deal — beginning this year and extending through 2019 —that includes the much-anticipated live-action and animated tentpole releases from Walt Disney Animation Studios, Pixar, Marvel and Lucasfilm. Highlights of the agreement include IMAX’s involvement in the release of Lucasfilm’s untitled Indiana Jones film, untitled Han Solo Star Wars anthology film, Star Wars: The Last Jedi and Star Wars: Episode IX; Marvel’s Black Panther, Ant-Man and the Wasp, Captain Marvel, Avengers: Infinity War and the untitled Avengers sequel, which as previously announced will both be shot entirely with IMAX cameras by the Russo Brothers; Disney’s Beauty and the Beast, A Wrinkle in Time and Mulan; Pixar’s The Incredibles 2 and Toy Story 4 and Walt Disney Animation Studios’ Wreck-It Ralph sequel.